Researchers at two major universities have just discovered a new way to create high-quality curved artificial corneas. 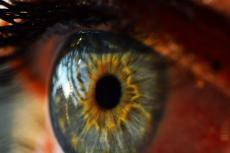 Eye experts believe these new tissue-derived corneas could work just as effectively as donated human corneas. Scientists at both the University of California and Newcastle University put a group of healthy corneal cells on a curved surface. They found that the corneal cells soon adapted to this surface and formed a perfect dome-like shape. Che Connon, a professor of tissue engineering at Newcastle University, was the head author on this study. He told reporters that growing corneal cells on a curved surface is a simple and cheap way to produce comfortable high-transparency artificial corneas. Dr. Connon said that this method of producing corneas is actually more effective than complex practices other doctors have tried in the past. Eye banks around the world are desperate for cornea donations to meet the growing demand for transplants. Since these new curved artificial corneas have the potential to work just as well as human corneas, there's hope that they can address the global shortage of human cornea donations. Although these curved corneas are artificially produced, they are far superior to the plastic corneas doctors sometimes use in corneal transplant surgeries. Because plastic corneas aren't derived from corneal cells and aren't formed on curved surfaces, most of the time the patient's body expels them. Another plus for these tissue-derived corneas is that they can refract light better than plastic corneas. By helping the eye naturally process light, these curved corneas will give patients a greater sense of clarity. Study authors note that this method of tissue engineering can be used in many other fields of study. They suggest that biologists and even stem cell researchers might want to think about placing their tissue samples on curved surfaces in future experiments. The cornea is the curved part of the eye located on the outermost layer. In addition to protecting the eye from germs, the cornea also helps naturally bend light waves. Approximately 10 million people around the world have some form of corneal blindness. Some 6 million of these corneal blindness cases are in India. Due to the global shortage of donated human corneas, only 100,000 people will receive proper corneal transplant surgeries. Becoming a cornea donor is as simple as becoming an organ donor. The only people who might be disqualified from donating corneas are those who've had severe corneal illnesses or significant laser eye surgery. There are many reasons why a person may need corneal transplants, but a few of the most common diseases include keratitis, keratoconus, and corneal ulcers. Doctors have to remove and store corneas shortly after a person dies for them to be useful. Therefore, it's imperative for cornea donors to let doctors, family, and friends know about their intention to give away their corneas after passing away. For more detailed information on this new method of manufacturing corneas, check out the latest edition of Advanced Biosystems. The article is listed under the title, "Template Curvature Influences Cell Alignment to Create Improved Human Corneal Tissue Equivalents."